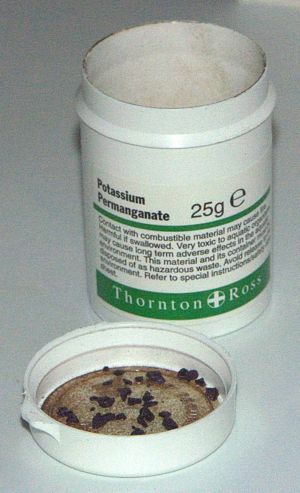 Potassium permanganate (PP) is a compound that is used by aquarists for the disinfecting of plants or ornaments before placement into aquariums. It is used to remove organic build-up in tank water, and kill bacteria and fungi. It is also employed to treat some parasites that infect fish. Potassium permanganate is the chemical compound KMnO4. The salt is also known as "permanganate of potash" and "Condy's crystals". The permanganate ion is a strong oxidizing agent. It dissolves in water to give deep purple/pink solutions, evaporation of which gives prismatic purple-black glistening crystals (see picture below). Potassium permanganate stains skin and clothing and should be handled with care. Clothing stains may be washed away using acetic acid (vinegar). Skin stains disappear within 48 hours. To remove stains caused by potassium permanganate, use a solution of Sodium metabisulfite/Sodium metabisulphite. This is a food preservative called E223 that can be found at a grocery or home brewing beer shop. It is sold in pharmacy or chemist shops over the counter and is usually supplied in the form of a small container of around 25g consisting of small blue crystals. It's usually less than £1, 1 Euro, 2 US Dollars. TIP: To aid accurate dosage, a stock solution of one gram per litre of clean water (preferably distilled or de-ionized water) could be used, giving 1 mg potassium permanganate per ml of water. TIP: Potassium permanganate rapidly loses its potency when exposed to light and air. So keep any solution you make up well away from light and in a airtight container. Ensure you clearly mark any such container as poison and keep it well away from children. Dispose of carefully after 2–3 months. To prepare for the disinfecting of aquatic plants, prepare 1 Litres (0.3US G.) of lukewarm (25°C (77°F) ) clean tap water and drop 10 mg of crystals into it and stir until the solution turns deep blue/purple. Be careful as this solution will stain and is toxic to life. Dip the leaves of the plant into the solution for 10 minutes, being careful not to dip the roots of the plant in it. This will kill live snails as well as snail eggs and parasites . Potassium permanganate can be used to treat parasites on individual fish. It will eliminate anchor worms, fish lice, flukes, ich, costia, cotton mouth, fungus and many types of bacteria. Prepare 8 Litres (2.1US G.) of water at aquarium temperature and add 1/8 teaspoon (0.6g) of crystals. Dip fish into solution for 5 minutes. If fish looks stressed, remove at once. Dip fish into clean water for a few seconds to rinse. Do NOT use this level of potassium permanganate in an aquarium tank! Potassium permanganate is an effective anti-parasite treatment (Ich, etc. ), as well as being able to remove odours from tanks and increasing the redox potential of the water. However as this compound is very toxic, using the wrong dosage will result in killing all life in the tank. Please read this excellent article on how to get the safe dosage on FishDoc.co.uk. Biological filtration systems should be removed before applying. This compound works best with little or no light. Typically used against bacteria (including your nitrifying bacteria in your filter) and parasites. You use a solution of 2ppm (this is 0.5 grams per 380L (100 US gallons) or 0.065g per 50L). Repeated every 2–3 days for a maximum of 5 treatments. The build-up of odours in old aquariums is caused by the decay of organic material. You need to prepare a dosage of 0.5ppm of PP. This is 0.065g per 200L of water to give you 0.5ppm in solution. 0.065g of PP in 1L of water will give you a 100ppm solution. So using 5ml of this solution per 1L of water will give you a 0.5ppm level. This is approximately 6 medium sized crystals of PP. Ensure you know the real water volume of your aquarium and not the stated tank volume as the ornaments, equipment, water level and substrate will lower the manufacturer's stated volume. To reduce the smell, place the crystals into a small clear container and add 1L of warm water (preferably distilled or deionized water). Stir carefully until the water is deep purple and the crystals are fully dissolved from the bottom. Then using great care add 5ml slowly into your aquarium and repeat. Stop adding as soon as you see the overall tank water stained very light pink. A 30 Litres (7.9US G.) tank may only require 5-10ml. It can be useful to place a white saucer on the floor of the aquarium to observe the water colour. Switch off the tank lights (Potassium permanganate rapidly becomes neutralised in light) and ensure the tank is well aerated for the next 12 hours. Turn on the lights briefly once an hour to monitor the water colour (don't be surprised if the light pink colour has gone) and the to monitor the fishes reaction (if they are gasping for air you will need to add more aeration or do a water change). Don't apply any more for a further 12 hours. Reapply after 24 hours have passed from the initial dosage if required. This slow deliberate action will remove the organic matter causing the smell and will increase the ability of the water to hold more oxygen. Smell the water after 48 hours have passed and re-apply if necessary. Depending on the condition of the tank it can take 2 or more applications before you notice an improvement. Don't apply more than 5 treatments within a week. Each time you add this small dosage you should notice that the time it take for the pink colour to disappear should take longer as the Potassium permanganate destroys the dissolved mulm and other dead organic material. Simply engage in regular partial water changes, and use fresh activated carbon in your filter(s). MSDS Safety Sheet - read this! This page was last edited on 15 December 2013, at 17:00.